Israeli aircraft struck armed Palestinians in northern Gaza early Friday, after the bloodiest day of clashes in the strip since Israel withdrew last summer. More than two dozen Palestinians and one Israeli soldier were killed in fighting that broke out in the area after Israeli tanks and troops, backed by aircraft, seized control of a ribbon of land in an attempt to win freedom for a captured soldier and put Israel out of the militants' increasingly longer rocket range. Meanwhile, for the first time, an Israeli official has suggested it might release Palestinian prisoners to win freedom for an Israeli soldier held by militants in Gaza. About one-fifth of the 165,000 Palestinian government employees will receive a small down payment on long-overdue salaries, officials said Friday. The 165,000 government employees form the backbone of the Palestinian labor force and their salaries sustain about one-third of the Palestinians. Iran's hardline President Mahmoud Ahmadinejad warned on Friday that continued Israeli strikes against Palestinians in the Gaza Strip could lead to an "explosion" in the Islamic world that would target Israel and its supporters in the West. He also again questioned Israel's right to exist. "This is a fake regime ... it won't be able to survive. I think the only way (forward) is that those who created it (the West) take it away themselves," the president told a rally in Tehran in support of Palestinians. Immigration to Israel is expected to post a three-year high in 2006, boosted by a jump in those moving to the Jewish state from North America, reports CBS News correspondent Robert Berger (audio). Seven planeloads were expected to bring 3,400 immigrants from the U.S. and Canada — the most in 23 years. With Israel losing the demographic race to the Palestinians, officials say immigration insures the survival of the state of Israel. Israel renewed its assault in northern Gaza with at least three air strikes Friday. It says the aim of the Gaza operation is to halt weeks of Palestinian rocket attacks, and to press for the release of the Israeli soldier who was kidnapped two weeks ago, reports Berger. Avi Dichter, Israel's minister of public security, said that once Cpl. Gilad Shalit is released and militants stop rocket attacks from Gaza, "then, in a goodwill gesture, Israel, as it has in the past, knows how to free prisoners." It marked the first time Israel has expressed willingness to free Palestinian prisoners in exchange for the soldier. Initially, Hamas militants demanded the release of hundreds of Palestinian prisoners held by Israel. However, the group then reduced its demands, seeking only the release of several dozen female prisoners and male inmates who have served long sentences, according to a senior Hamas official. Israel has said it would not release prisoners in a direct exchange for Shalit. Egyptian mediators have proposed a two-stage process. Hamas would free Shalit and stop rocket fire, and Israel would eventually free an unspecified number of prisoners as a goodwill gesture. There has been no recent word on the fate of Shalit, captured June 25 by Hamas-affiliated militants. "He was taken out of his outpost walking, he will be returning to us walking, alive, and safely back to his family," vowed Israeli spokesman Raanan Gissin. Israel, meanwhile, signaled its intention to reduce the scope of its operation in one of two northern Gaza towns it invaded on Thursday. Lt. Col. Yaniv, a battalion commander, said he expected troops to wind up their mission in parts of Beit Lahiya within a day or two because their mission there would be accomplished. Those areas include a neighborhood where Palestinian militants fired rockets into the southern Israeli city of Ashkelon earlier in the week, reaching significantly farther inside Israel than at any time before. Israel insisted it was not planning to reoccupy Gaza, but military commanders said they had orders to win the soldier's release and prevent militants from firing rockets, even if that meant repeated short-term incursions. On Friday, Defense Minister Amir Peretz and military chief Lt. Gen. Dan Halutz visited a base in southern Israel that is a staging area for the operation. "We have no intention of sinking in the Gaza mire," Peretz said, repeating an earlier vow. On the other hand, "we will find a way to hurt anyone who tries to hurt Israeli citizens," he added, accusing militants of using Palestinian civilians as human shields. Halutz wouldn't say when Israel planned to wind up the northern Gaza campaign. "It doesn't mean there won't be Qassam (rocket) fire if we leave tomorrow or the day after," he added. "But it does mean that terror organizations will pay a high price for every Qassam fired." Palestinians fired 14 rockets at Israel in the preceding 24 hours that led up to Friday's early morning air strikes. Seven landed in Israeli territory, the military said, but no one was hurt. The Israeli incursion into northern Gaza was centered in two densely populated towns where militants often fire rockets, Beit Lahiya and Beit Hanoun. Dozens of Palestinian casualties, most of them militants but including many wounded women and children, crowded the emergency rooms and corridors of Gaza hospitals, already suffering from shortages of medical supplies because of a closure Israel clamped on the territory after the soldier's capture. After touring Gaza's main hospital Thursday evening, Palestinian Prime Minister Ismail Haniyeh of Hamas called for international intervention to stop the Israeli offensive, which he called a "crime against humanity." Haniyeh called the Israeli push "a desperate effort to undermine the Palestinian government under the pretext of a search for the missing soldier." His Hamas movement, with a history of violence against Israel, was voted into power in a January parliamentary election. It was not clear how many civilians were killed, but Hamas said seven of its gumen died. Ali Ajrami, a tailor living in a farm house in Beit Lahiya, was trapped with his nine children in one room after Israeli tanks parked behind his house and special forces took positions on the rooftops of neighboring buildings. An Israeli soldier died in one of the skirmishes — the first Israeli casualty. 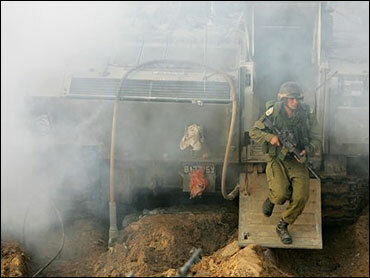 Israel Radio and Army Radio said the army was checking the possibility that he was killed by errant Israeli gunfire. The army spokesman's office said he was killed by a Palestinian gunman.